There are few things in my life that I adore as much as my family and friends, but one thing that comes close is my adoration for a finely crafted party invitation. I know most times it would be perfectly acceptable to send out an email or facebook evite to a party but something inside me beckons me to take it a step or two further. In regards to our New Years Eve party I think I may have taken it 26.2 miles worth of steps further. This year we're geared up to have a 'throwback' party where guests may dress in attire from the past, 50s, 60s, 70s, 80s, 90s....hell if they can come up with something from the 20s I say kudos to you sir or mam. The invite was done and redone and finally this is what I came up with. Inspired by a combination of Kris Kross (because they make me jump jump) and Salt-N-Pepa (pu-push it real good). 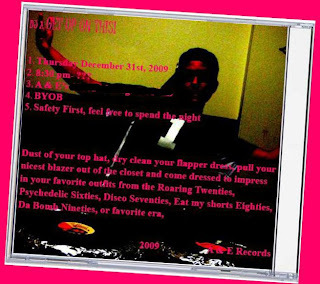 To sweeten the pot, party favors will likely include DJ A's "Get up on this" Throwback Mix CDs. Consequently I am wondering how much damage aside from the scar on my forehead (or fivehead) was done when I fell out of my dysfunctional high chair as a child.